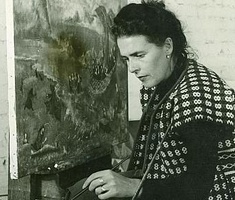 Leonora Carrington was born on April 6, 1917 in Chorley, Lancashire, England. In 1936 she enrolled at the Ozenfant Academy of Art in London where she later met Max Ernst. She and Ernst become romantically involved during a trip to Paris and it was through him that she befriended Joan Miro, Andre Breton, Pablo Picasso, Salvador Dali and other great painters that hung around the Café Les Deux Magots. In 1938 she published a book titled "House of Fear" and also exhibited her paintings with Ernst at the International Surrealism Exhibition in Paris and Amsterdam. Nazi occupation in France and the arrest of her lover forced young Carrington to flee to Santander, Spain where she spent some time at a psychiatric ward treating a nervous breakdown. In 1941 she left Spain to go to Lisbon and seek asylum at the Mexican Embassy. Through her marriage to famous writer Renato Leduc, she was able to achieve Mexican citizenship and reunite with her exiled colleagues in Mexico City. In 1943 she divorced Leduc and started working with André Breton, Benjamín Peret, Alice Rahon, Wolfgang Paalen and Remedios Varo, with whom she forged a great friendship. She was recognized numerous times in Mexico and abroad for her stunning creations. Leonora Carrington, perhaps the best known artists of the surrealist movement in the world, died of pneumonia on May 25, 2011 at the Hospital Ingles in Mexico City.